Make important decisions efficiently, transparently and fairly. Value for money – compare alternatives’ value for money (e.g. projects, investments) and allocate resources. 1000minds is useful in all sectors, including health, government, business and nonprofit – see our case studies and publications. We can also help you build customised decision-support solutions. 1000minds implements our patented PAPRIKA method, which, as well as being scientifically valid, is very user-friendly (see our awards). 1000minds is fast and scaleable – e.g. depending on your application, potentially 1000s of people can participate. Most decision-making applications involve, at least implicitly, the process represented in the flow diagram below. 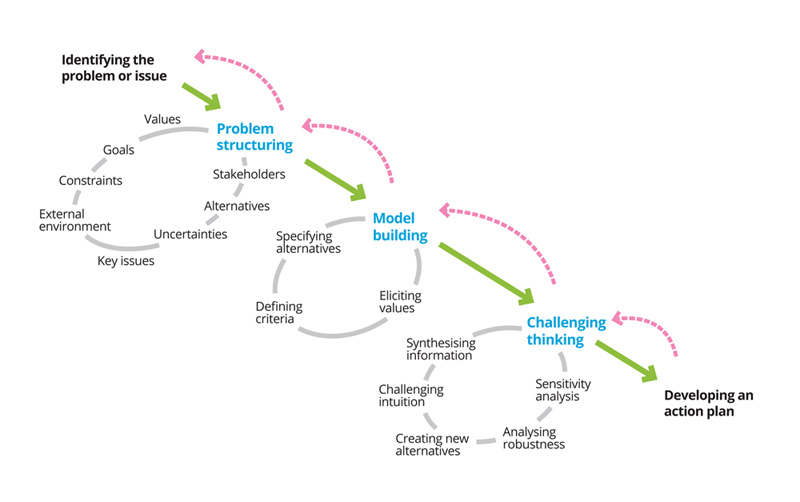 1000minds is especially useful at the “Model building” and “Challenging thinking” stages (see the diagram). Or build your own decision models from scratch.